Well, my “No-Dig” veg patch is a little less “no-dig” this week… my 5 naughty hens have managed to find a way through the fence and into the veg patch, and are merrily pecking around, scratching up all the compost, eating all the chard and most of the kale and generally not being very helpful. But they are at least having a LOVELY time. I haven’t yet had a chance to sort the fence out, and since I won’t be able to get to it until the weekend, I thought I’d scrabble around for some inspiration. One of the things I love about creating and tending to a veg patch is the creativity that comes with trying to save money. 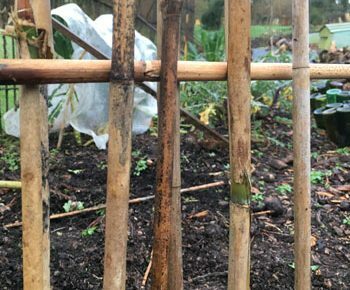 The current fence that divides veg patch from chicken run is just a cheap chicken wire and not-very-sturdy post solution that I put up a couple of years ago. It has been quite good in that it isn’t too unsightly and for the most part has stopped the hens from flying over, but I’m keen to get something a bit more sturdy now that their chicken run has become somewhat more permanent and I have no plans to further encroach on their space with veg beds! This is brilliant! So simple – just get a load of old pallets (easily found pretty much anywhere in the country) and use posts to secure them. I like that you can paint the pallets if you want, also the gaps between the slats make it look a bit more open, but mostly, you can grow things in/up the pallet. If I was a bit more patient, and more fond of DIY, I would definitely have a go at building one of these. I’m lucky in that I live in a place surrounded by run down woodland, so it would be very easy to get hold of the branches needed to build it. But, for me the effort involved (and the size of the chicken run) makes it a no-go, but if you’re more patient than me then it could definitely be a contender! Lovely and natural, too! This is the one I’m going for! There are several clumps of unruly bamboo growing at the bottom of the garden, and I was going to cut them back anyway. So, now I have a great use for the bamboo that I cut down. 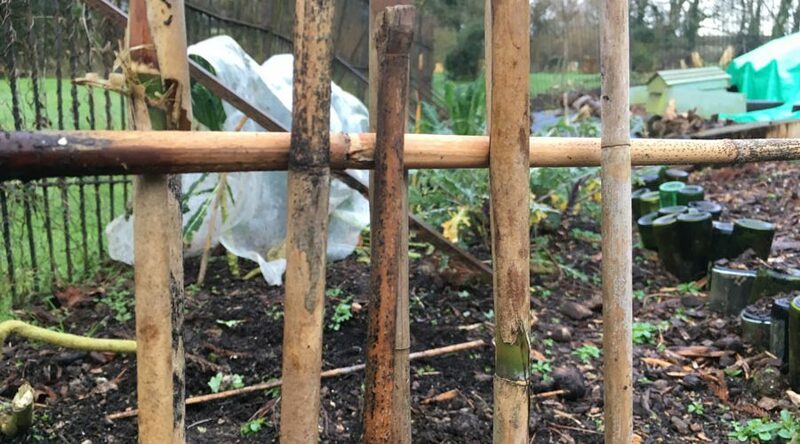 I’m going to cut it to about chest height, which hopefully will keep the chickens from flying over and jam each bit of bamboo into the soil, with sturdier posts at intervals. Then, a couple of horizontal bamboo “bars” woven in and tied in to keep it all nice and secure. I think it could be brilliant!